What typically happens is people are all excited about the prospects of reaching their resolutions they jump in head first. They do well the first week or two, sometimes longer. Come the end of January, it is an entirely different story. They might start to feel run down, tired, and stressed out because they are spreading themselves too thin. It can be hard to focus on a resolution while still having to juggle a job, family, and other responsibilities. Eventually, whatever the resolution was, it becomes too much to continue. Life gets in the way and you find yourself slowly slipping back into your old routines and habits. If you are tired of going through the same cycle of never reaching your New Year’s Resolutions, 2019 is the year to make a change on how you approach your resolutions. Step 1: Make a single resolution you want to accomplish, not a long “to do” list of resolutions. If there was one thing you could change about your life what would it be? Write it down and make this your resolution for the coming year. For instance, you want to be healthier. The process of becoming healthier could involve changing your diet, exercising more, and stop smoking. By focusing on this one single resolution, you would actually take care of three or possibly more “to do” list-type resolutions. Step 2: Establish a strong support system to keep you motivated and focused. The next thing you want to do is make sure you have the right support system in place. You should never go it alone when working on improvements to your life. You need to surround yourself with family and friends that are supportive and can provide inspiration and motivation as you work towards reaching your resolution. Step 3: Give yourself the time you need to reach your resolution. It takes time to make changes to your life, give up old habits and develop new ones. It is better to gradually work on your resolution and make changes slowly so you have time to adjust. Take your time, work with your counsellor, and use your support system. Eventually, you will accomplish your resolution! 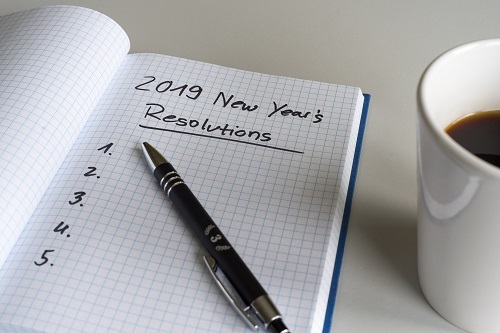 For help reaching your New Year’s Resolutions in 2019, please feel free to contact Ellen Starr, Toronto life paths and goals counsellor, at 416-488-3102 today!